I had so much fun reading Moving 'Em and experimenting with the tips found within its pages. I grew up on a cattle ranch and have been around cattle all my life, but this book completely changed my understanding of how cattle think and how I interact with cattle. It turned every trip to the pasture or corral into a game because I could see positive changes within minutes of trying each new technique for the very first time. I couldn't wait to read a new chapter each night so I could take what I had learned with me to work the next day. How to trouble-shoot corrals and cattle handling facilities - from corral layout, to the location of shadows, the noises and smells they encounter in the chute, and where to stand to prevent balking in the loading alleys. Moving 'Em is the perfect combination of cattle psychology and practical hands-on how-to advice. It's equally appropriate whether you own 10 cattle or 10,000, whether you have a pasture rotation or manage a feedlot, and whether you are in the cow-calf business or fattening cattle for slaughter. Your cattle will teach you so much as you read this book! This book is currently out of print, so finding a copy takes a bit of extra work. New and used copies do periodically crop up on Amazon in a range of prices (original list price of $29.95). It is also available to borrow through many of the public library systems in North America. 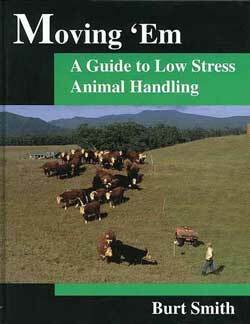 Have you read Moving 'Em: A Guide to Low Stress Animal Handling? Share your review in the Comments section below!